Put a little "WOW" in your life! 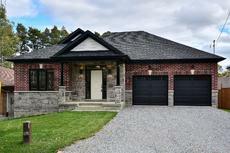 Welcome to your perfect retirement bungalow in the sought after town of Uxbridge! This brand new custom built beauty offers 1850 square feet of luxurious open concept living and is loaded with upgrades and high end finishing's. This entertainers dream layout is showcased with hardwood & porcelain flooring throughout, 9' flat ceilings including coffered in some feature rooms, pot lights galore, deep plaster crown moldings, high baseboards and 3" casings, designer fixtures, high vanities, 7' interior doors, Shaker cabinetry with Quartz counters and 6 stainless steel appliances. The full unfinished basement is perfect for finishing with multiple oversized windows and a rough-in bath.